"Today, we were called by people who had been illegally sent back to Libya. They had been intercepted by a merchant ship and told they were going to be brought to Europe. Instead, they found themselves in Tripoli." Alarm Phone contacted one of the migrants involved in the rescue in question, who described what had happened. "We were 62 people on a dinghy. A boat approached us and brought us on board. They told us: 'We're going to take you to Rome.' Then they gave us biscuits, medicine ... We went to sleep, we were exhausted. At 8:45, when we woke up, we were in Tripoli." This is not the first time that Alarm Phone, which is managed by activists, has been alerted by migrants to this kind of practice. Several commercial vessels – not humanitarian boats – have reportedly lied about where they planned to disembark rescued migrants and returned them to Libya. "It looks like it's a new tactic of the crews of commercial ships," Maurice Stierl, a member of Alarm Phone, told InfoMigrants. "We think it's a strategy to avoid unrest on board. It's really very cynical." InJanuary, Alarm Phone reported that 140 people, rescued by a commercial ship, the Lady Sham, had been returned to Libya, again, without being informed. InfoMigrants was able to contact Sara* who was on board. 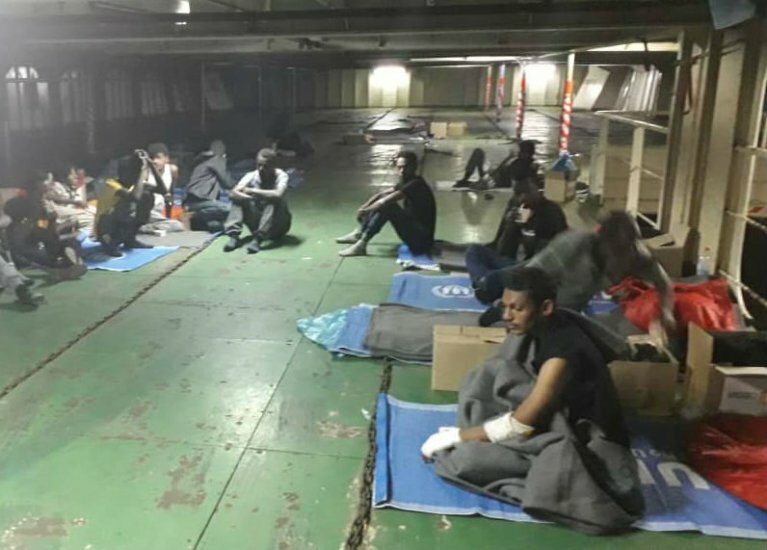 "When we were picked up by the Lady Sham on the open sea [on the 20th of January], the crew told us that we were heading to Germany, but the next day we realized that we had been sent back Libya." Another example was the Nivin, the commercial ship that came to the rescue of 90 migrants in November, 2018. Some people on board, like Mohamed, told the newspaper Le Monde that the Nivin had not stated its destination. "Instead of bringing us to Malta, they brought us back to Libya," he said. He pointed out that the boat he had been on was not in distress when the Nivin approached them. Are the companies briefing their ships? The practice of "refoulement" to Libya, considered an unsafe country, has been denounced by numerous associations and NGOs. The detention centers to which migrants are sent when they are rescued at sea are especially bad, with poor sanitation and violence. It's hard to know who started using this "tactic", whether companies are briefing their commercial ships, or whether the coast guard are giving instructions. "We don’t know," said Maurice Stierl. The return to Libya of the Lady Sham and the Nivin gave rise to rebellions. For twelve days, from November 8 to 20, the migrants on the Nivin refused to disembark before finally being evacuated by force.